Within a week of moving to Austin in January 2005, Daniel walked into Austin Tri Cyclist on Barton Springs Road, bought a swimsuit, and decided he was going to do a triathlon. Only two problems. He didn’t know how to swim. And he was terrified of deep water. So Daniel focused on running. 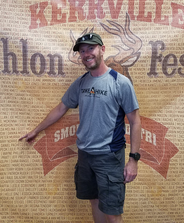 He signed up for the Austin Distance Challenge and ran the Austin Marathon. Then, he bought a bike and started commuting to his job in Manor. With running and biking down, Daniel really wanted to learn to swim, but he couldn’t get over his fears. Fast forward to January 2013. Daniel was attending law school in Washington, D.C. when he heard that the DC Triathlon Club was offering a New Triathlete Program for folks interested in trying out triathlon. He signed up. With the help of several patient volunteer coaches, Daniel learned to swim a lap, then two, and then twenty. He was hooked. Daniel completed Ironman Chattanooga a year later and then Ironman Mont-Tremblant in 2015. Long having missed Austin, Daniel returned home in 2016, with his wife and fellow club founder, Meghann. Daniel created Austin Tri Club because he loves Austin—the people, the trails, Barton Springs—and he loves the sport of triathlon. He hopes that Austin Tri Club can increase access to triathlon for all Austin residents, and that the club can provide a fun, supportive, and welcoming environment for triathletes of all abilities. Dena had started many Couch to 5K running plans over the years, but never finished any of them. It wasn’t until she signed up for a local 5K in Massachusetts in 2008 that she was able to stay motivated and finish the plan. Her love of running grew as she continued to challenge herself with longer races. 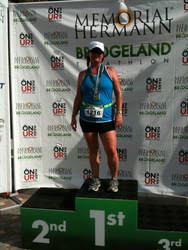 The next year, she joined her sister-in-law who was doing her first sprint triathlon, and got the triathlon bug too. For the next few years she trained and raced with the Northampton Cycling Club triathlon team and learned so much from this supportive community. Since moving to Austin in 2012, Dena has continued challenging herself while exploring trail running, cyclocross, and more triathlon racing including a couple of 70.3 races. She’s excited to help grow the Austin Triathlon Club and spread the love of triathlon in Austin. In 2007, Larry set out to lose weight and “get into shape”. That led to running a 5k and he still remembers thinking that running longer than that, for him, was impossible. Eventually though, the races got longer and longer, until he did his first marathon in late 2008. He then bought a bike to ride and started learning to swim. 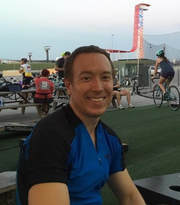 He found he loved triathlon so he joined and then later served as a board member for the Oklahoma City triathlon club, TriOkc, before moving to Austin in late 2011. He's completed 3 iron-distance triathlons and countless other distance triathlons, but still remembers the struggle of swimming 25 meters in the pool when he first started, and the help and support of other triathletes that helped him to keep going. He loves helping and seeing people accomplish what they once thought was "impossible." Jennifer has been a competitive swimmer since she was 5, swimming on the neighborhood swim team. Eventually she thought that running was a great way to stop the weight gain that seems to haunt a person as they age. First doing some local 5ks until making the first marathon attempt in Houston. Since that didn’t go so well, Jennifer’s training shifted focus by adding cycling. She went and bought a hybrid from Walmart and let a friend talk her in to putting her 3 activities together and signing up for her first triathlon. It’s been a crazy ride since then, having completed 4 HIMs, many Olympic and Sprint distance triathlons, and finally got a full marathon under her belt. With only one distance left to conquer (yep, the big 140.6), Jennifer is excited to be a part of Austin Triathlon Club in order to provide a supportive, and informative atmosphere for others to fall in love with Triathlon. It’s a great ride to be on! Laura​ got her start in triathlon as a grad student in Memphis TN who was looking for people to run with while training for her first half marathon. She was fortunate enough to find a 'triathlon' class at the school fitness center. While not knowing exactly what triathlon was, one component was running so she signed up! The coach of this program, Joy, was an experienced triathlete training for Kona. Joy's enthusiasm convinced Laura to learn how to swim laps and participate in her first triathlon, Memphis in May, an Olympic distance race, five months later. Laura went on to meet some of her dearest friends through triathlon, become a member of two triathlon teams, and compete as an age group triathlete in every distance including Ironman Lake Placid in 2011. Currently, Laura is focused on long distance trail running, but she still enjoys a good bike for cross training. Laura believes the running and triathlon community has kept her healthy - both physically and mentally - and she is excited about the opportunity to extend that welcoming community through the Austin Triathlon Club. ​Michelle started running at the age of 37 when a good friend suggested a half marathon as a way to spend a girls’ weekend away. The friend ended up getting knee surgery, but Michelle ran the half anyway. Little did she know, this jump start into running would be a life changing event leading to a new perspective on exercise, health, and fun! Since that first race, Michelle ran several marathons and during the training met some really awesome triathletes who inspired her to branch out. She completed her first sprint tri in 2013, getting a flat tire during the bike and not really knowing how to change it. Fortunately, another racer stopped to help, just proving how friendly the tri community can be. Since then, Michelle got involved with an incredibly supportive team of triathletes of all levels in Richmond, VA. Through this group, Michelle has met some of her closest friends. With the support of a great coach and this team, Michelle completed a variety of distance triathlons including 2 Ironman races. In early 2018 Michelle moved to Austin for work and sought out the tri community as a way to connect with new faces. Michelle’s goal for joining the board of Austin Triathlon Club is to promote the tri community by coordinating group workouts and educational clinics as a way for like-minded athletes to support one another. Totally “on a lark” Craig did his first triathlon, the third in Texas, in 1981. That led to learning how to really swim, run and bike. That led to qualifying for a national championship in 1986 and a world championship in 1993. Thirty-eight years in the sport involved travels all over the world, meeting wonderful people, helping to put on races, and doing a bit of coaching.